The home stretch is here! When I run half-marathons I gain a burst of energy when the Finish Line banner beckons me home. 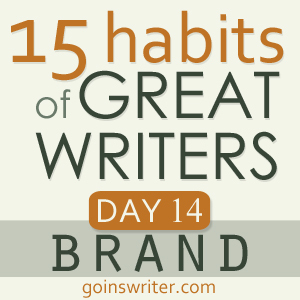 On Day 14 of the Great Writers series the challenge is to brand myself. Name. This is what you call yourself (e.g. Copyblogger or Anne Lamott). It may be your given name or a pseudonym or something else, but you need to be consistent. Make sure your website, business cards, and social media properties all say the same thing. Image. This can be a logo or a headshot. It’s whatever you want to use to make people recognize you and your work. If it’s a photo of you, make sure people would recognize you in real life if they’re seeing it on the Internet. Also, make sure it’s on your blog, Twitter profile, etc. Don’t use different images; make them all the same. Michael Hyatt does a great job with this. Voice. This is how you sound. It’s your style and personal flair as a communicator. If you aren’t confident in your unique writing voice, go through these 10 steps to find it. I've spent the last 4 years focusing on branding my photography business it never occurred to me to brand my writing persona. Question: is it possible to fuse the two? I've kept my photography blog separate from this one because as I've mentioned in previous posts I'm a chronic compartmentalizer. My name remains consistent as I cross over from personal to photography but I only have a logo for my business. As for my voice I've established my style of communication in my writing and photos. Since I've started this blog years ago I've always had the tag line: And how I laugh in the face of adversity affixed to my blog header. My profile description has also changed over the years but the tag line remained the same. After my second divorce my first blog was inadvertently deleted along with the Gmail e-mail account I possessed at the time. When I slam the door to a chapter in my life I start over from scratch which is where the phrase "And how I laugh in the face of adversity," was derived. My friends have always told me that no matter what obstacles I've overcome or challenges I've faced I continue to smile and laugh. This is my brand, my logo, my voice. It is who I am. But I'm open to suggestions. A handful of friends think I'm "crazy" for neatly segregating all aspects of my life while others understand my need for compartments. Is it possible to fuse my personal blog with my photography persona?